Sound Cards are one option for managing the input and output of audio signals in your Digital Audio Workstation. They interpret and convert the assorted audio signals that are encountered throughout your home studio using components such as Analog to Digital Converters. They perform the same function as you'll find in an Audio Interface. One important note is that sound cards rarely have mic preamps, so you will likely need to take care of that with another piece of gear. The PCI card can be installed directly onto an empty slot on your computer's motherboard. One downside of the PCI card option is that you will need constant access to the rear panel of your computer. Most of the time you will want to have the computer tucked away so that it's out of your hair and to keep the noise down from the fans... the computer cooling fans, not your adoring followers - That will all come later. Having to get down on your stomach to crawl around and search for a specific cable on the input/output (I/O) interface a midst a sea of cables and power cords is not a fun thing. Not a deal breaker, but certainly another thing to consider. It's also nearly impossible to read the labels from the card inputs if the connections are made, so label your cables accurately if you decide to go down this road. Some cards will support a breakout box that can connect via firewire, USB, or ethernet, allowing you to make your connections at a more convenient spot. In addition to being easier to access, the breakout boxes may provide the mic preamps and other inputs that you're looking for. These breakout boxes with preamps on board offer the same capability of an audio interface in the end. The main difference being that you don't need to connect it via some high demand input (such as firewire or USB) but instead have a dedicated PCI card. With this setup you can connect directly to your PCI card and have the flexibility to put the I/O where it is more accessible. This also gives you the flexibility to expand later on down the line using these dedicated inputs. 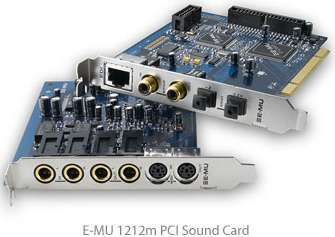 Just remember that if you are only interested in MIDI data, you can get away with just a sound card. But if you're looking for preamp inputs for mics and instruments then you'll have to get some additional hardware such as a mixing console, audio interface, or stand-alone mic preamps. I can still vividly recall when I began learning how to create a studio on my own I was completely confused by the sound card discussions. I think more than any other roadblock the sound card vs. audio interface question gave me the most trouble. Is this something I need?!? Is this something that I can do without?!? So for the benefit of those of you attempting to make this decision let me say this... Get an Audio Interface. With the proliferation and speed of today's USB and FireWire interfaces, the internal PCI card may be nearing the end of it's life cycle. And you don't want to be "vinyl records guy" in the age of digital downloads. Sound cards don't sound better (just like vinyl doesnt but that's another discussion), and they're not easier... they're just older. So for all these reasons I recommend a digital audio interface over a sound card for the first-time home studio recorder.